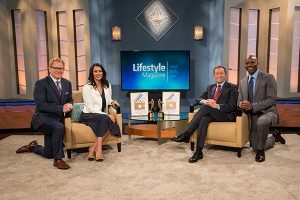 Lifestyle Magazine is a weekly talk show designed to address the health, relationship, and social issues people face every day. Mike Tucker and his team of co-hosts interview a variety of authors, experts, and interesting guests who share their stories and practical advice. Lifestyle Magazine is modeled after Christ’s method of ministry. Just as He cared for His followers by meeting their physical and emotional needs, Lifestyle Magazine seeks to earn viewers’ trust by offering insightful answers and practical help for life from a Christian perspective. Lifestyle Magazine seeks to overcome religious prejudice—to offer hope, help, healing, and a personal connection with a God who cares. This entertaining, award-winning program can be seen in North America on broadcast and cable television in over 450 markets. Check your local listings for Lifestyle Magazine or Click Here for a listing of major networks. For more information on Lifestyle Magazine or to watch now, visit our website at www.lifestyle.org. Are you ‘madly in love’ or ‘just plain mad’? The Mad About Marriage live seminar, developed from the original television show, asks this very question and offers people the opportunity to enrich their relationships. Obtain marriage resources, register for the seminar and connect with the Mad About Marriage Team at www.madaboutmarriage.com. 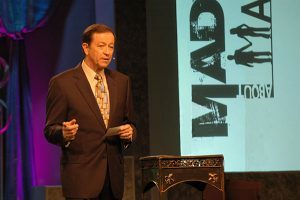 In the Mad About Marriage Seminars Mike and Gayle examine some of the issues that can derail marriages. They draw on current research and the expertise of a variety of scholars, authors and psychologists to find solutions to the problems.